Before I answer that question, let it be understood that the Brazilian Blowout is for girls with unruly curls. If this is you, Rejoice! Troy Richard Salon offers you a new straightening system from Brazil. The Brazilian Blowout arrived in stateside salons first, and now it's here in Frisco, Texas - ready to tame even the worst-behaved manes. Now you should understand that the Brazilian Blowout is a professional in-salon treatment now available at the Troy Richard Salon, as I just mentioned, but also know the Troy Richard Salon is 100% certified too. This is so important, if you want to leave the salon looking good. Certification is designed to teach stylists the techniques behind this highly sought-after treatment, and allow the stylist to perfect execution of this treatment. Stylist learn how to place orders for products needed for this in salon treatment as well as representing the after care product line. 100% Certification (in a nutshell) means that our stylist can analyze your hair, perform the treatment, customize after care maintenance for you and create the best hair condition you will ever have. The Brazilian Blowout takes about 2 hours. So you can get in, and get on with your day, loving your look. You'll start with a deep cleansing shampoo that creates the right surface for best absorption of the chemical, this is followed by a thorough blow dry and flat iron. Next, it's back to the shampoo bowl for a final rinse and back to the hair station for a final blowout. Because this is a cumulative process and unlike any other relaxer, the Brazilian Blowout actually improves your hair condition by creating a protein protective layer around the hair shaft resulting in a smooth surface able to reflect light. Did someone say "Shimmer?" 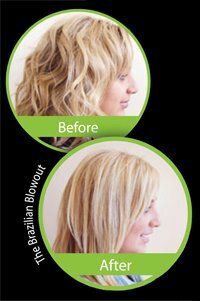 The Brazilian Blowout is a revolutionary treatment beneficial and suitable for all hair types, especially for damaged and chemically processed hair because it enhances the absorption of the Brazilian Blowout solution. Visit our website (www.troyrichardsalon.com) to view more before and after hair transformations. You'll be the hit of the town when you leave the salon with shiny, straight hair with no downtime, with ready to wear hair. This procedure does not require commitment, regrowth application and will last for as long as 2 months. The Brazilian Blowout also offers a after care maintenance, this post treatment line will prolong the efficiency of this procedure by combining the use of daily shampoo and a deep conditioning masque. Call us at the Troy Richard Salon for more details and schedule your appointment today (214) 618-8071. Bride Ideas from Ricardo Tomás - The Wedding Architect! It's not everyday you run into The Wedding Architect. I do know, that on Sunday, October 29, 2008, you sure can! Come to The Fall Bridal Show, at the Troy Richard Salon in Frisco, Texas. Save the date for your chance to sample some of the most eclectic vendors, normally reserved for the eyes and ears of Ricardo Tomás - The Wedding Architect. Yes, this is the same Wedding Architect featured in D Weddings. Do you know the difference between a wedding planner and The Wedding Architect? I mean, why The Wedding Architect over a basic wedding planner? The answer is simple. What kind of wedding do you want? Do you want a "basic" wedding or the wedding of your dreams? Basic is as basic does, and nobody wants to be basic... especially when it comes to one of the most important days of your life. Can you imagine someone asking you, "how was your wedding?" You answer, "oh, it was basic!" OMG! Ricardo Tomás aka The Wedding Architect is known for adding WOW to your wedding day. Don't do basic. Please! No, you don't want cookie-cutter bride ideas. You want a wedding that makes you cry. A wedding that makes you happy. A wedding with every dream you've ever had about that special day. And you want your wedding to be special in a wonderful way. Visit Ricardo's website (www.ricardotomas.com) Read the testimonials, take a tour of the Nearlyweds and Newlyweds photos. You'll see difference. Some of the greatest weddings. Guaranteed. and not on Bridezillas season finale! You have more than one option to buy tickets for $10 dollars. 1. Buy now online via Paypal. 2 call or vist the Troy Richard Salon at (214) 618-8071 before the show. 3. Pay $15 dollars at the door. It's a good ideat to buy your tickets early to get the best seats - up-close. Your ticket includes access to visit all the vendors... at no additional cost. Also you'll guaranteed entrance to the bridal fashion show by Lenz Boutique, and a opportunity to preview the Sophia Tolli wedding gown collection. That's not all. You'll enjoy the chance to talk "good looks" and get hair and makeup glitz and glam assistance from the best hair salon in Frisco, Texas; the Troy Richard Salon. The Fall Bridal Show is Sunday, October 26, 2008, 1PM to 4PM. For more information call the Troy Richard Salon at (214) 618-8071 or buy tickets online. Seating is limited, so buy your tickets before they are all gone. If you've already missed The Essence of Spring Bridal Affair, earlier this year; what the bridal fashion show here, I've included the video below.